Introducing the latest locomotive to be added to our ever-expanding fleet - Heljan's maroon liveried Class 52 - D1001 'Western Patfinder'. As with the majority of our DCC sound locos, she has a Howes decoder fitted with a 40 mm x 20 mm speaker attached to the underside of the roof. We have also fitted all of the buffer beam detailing to the Nº 1 end but left the Nº 2 end free so that it would not snag the NEM coupling. She was actually purchased a few months ago but has only just had her decoder inserted. We ran her in at the weekend and she does run very well and the Howes sound is fantastic. This means that we now have two diesel hydraulic locomotives although, unlike the Warship, D1001 will only be lightly weathered since it will become one of our celebrity locos. Despite this it will still be expected to perform a variety of duties and haul anything from express passenger to heavy goods. This, of course, does not mean that the railway is slowly becoming a GWR layout - far from it, in fact, as I am really not a Western Region fan especially since it was they who orchestrated the demise of the Somerset and Dorset Railway. This is something that, one day, will hopefully be reversed. With the imminent release of Dapol's Class 52, in both N and OO Gauges, it will be interesting to see how it compares to Heljan's version, which does have some issues in the looks department. 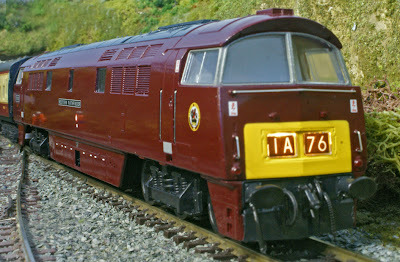 The Westerns are, arguably, the most popular of all the diesel classes and, despite its problems, the Heljan model has always proved to be similarly popular. This is probably because, until now, they have been the only OO models currently available.